To select the document printer upon a users FIRST login to a workstation you must hold the ctrl or alt key down when selecting "print". 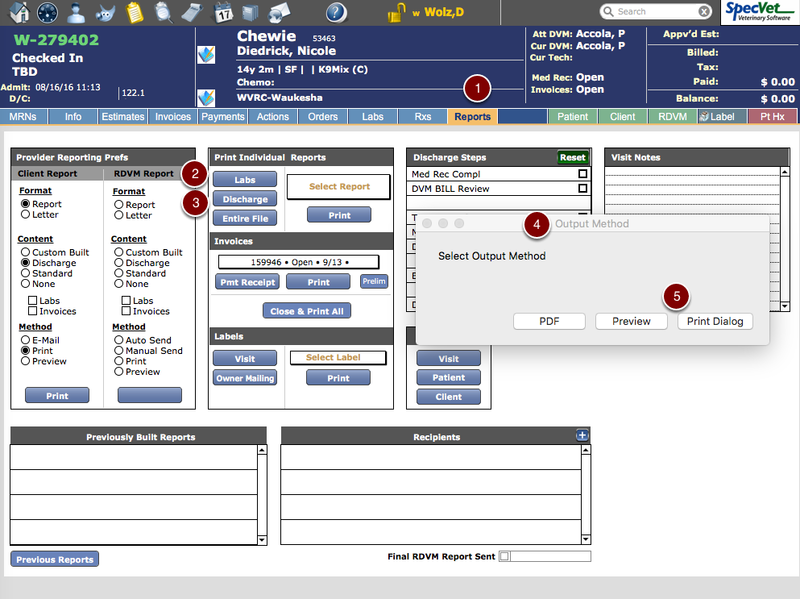 This will bring up the print dialog box that will allow you to select the printer of choice. Once selected SpecVet will remember this location for future printing. 1. Go to the Reports tab within a visit. 3. Select a robust report "Discharge"
6. The "Print" window will appear and the printer selection will be available. Select the destination printer, select print and SpecVet will keep this printer as your preference for future print jobs for this workstation. *Note: If attempting to print from "Print Preview" you may experience a screen lock due to the version of Adobe being used, if this occurs you may need to restart SpecVet.